The New York Stem Cell Foundation hosts a slate of on-going conferences, symposia and panel discussions that drive new ideas and set the bar for translational research. 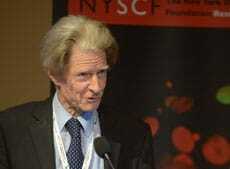 The New York Stem Cell Foundation’s Annual Translational Stem Cell Research Conference, held in October in New York City, is the preeminent forum for the leading minds in stem cell research from the United States and abroad. The conference convenes scientists, clinicians, policy leaders and advocates in a high-level discussion of the latest stem cell advances. Conference sessions focus on particular diseases, including diabetes, cancer, blood, heart and muscles, neurodegeneration, and spinal cord and other traumatic injury, with an emphasis on how to take this critical research “from bench to bedside.” NYSCF’s Postdoctoral Fellows present cutting-edge research in poster sessions. The conference is co-chaired by influential leaders in the field. Co-chairs have included Douglas A. Melton, PhD, Co-Director, Harvard Stem Cell Institute, Harvard University; John D. Gearhart, PhD, Director, Institute for Regenerative Medicine, University of Pennsylvania; and Nobel Laureates Harold Varmus, MD, Director, National Cancer Institute, and Paul Nurse, PhD, President, The Rockefeller University. NYSCF holds symposia for top stem cell researchers, policy makers and other interested parties to provide opportunities for the regular exchange of ideas and information. The camaraderie and collaboration across institutional borders cultivated through these meetings has already led to substantial acceleration of research in this area. A recent example was a meeting at which Dr. Harold Varmus, Nobel Laureate, Co-Chair of The President's Council of Advisors on Science and Technology and Director of the National Cancer Institute, moderated a conversation with policymakers, scientists and NIH members on stem cell research under policies of the Obama Administration. NYSCF's public outreach programs help ensure that the general public has access to straightforward, accurate information about stem cell research and its great potential for advancing treatments and cures for disease. Each spring, NYSCF hosts a panel that provides thoughtful, up-to- date discussion of the issues and challenges involved in stem cell research. 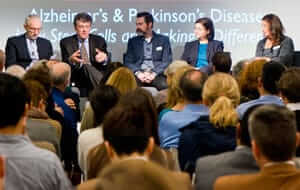 Participants have included leading stem cell scientists and patient advocates such as Michael J. Fox, actor; Michael Kinsley, journalist; Dr. Kevin Eggan, NYSCF Chief Scientific Officer; the artist Chuck Close;Dr.Howard Fillit ,Alzheimer's Drug Discovery Foundation; Brooke Ellison,The Brooke Ellison Project; and Zach W. Hall, former President, California Institute for Regenerative Medicine, and NYSCF Board Member.